It turns out that Washington Youth Soccer's elite players, teams and coaches weren't the only ones showcasing their talents at last month's Region IV Presidents Cup and Far West Regionals. In addition to achieving success on the pitch — with one team earning a regional championship and five qualifying for regional finals — Washington Youth Soccer also achieved success in the circle, as more than 50 of our state's most talented referees ran lines, officiated games and demonstrated to all the quality and depth of refereeing in the Evergreen State. A total of 21 Washington referees and three referee assessors attended the US Youth Soccer Region IV Presidents Cup in Morgan Hill, Calif. Ten of those referees were assigned to referee championship games and two were selected to attend the US Youth Soccer National Presidents Cup Championships in July in Greenville, S.C., where they'll join the Region IV Presidents Cup champions Tacoma United B98 Chelsea. In addition, 34 Washington referees and two referee assessors attended the US Youth Soccer Far West Regionals in Albuquerque, N.M., of which 17 were selected to officiate championship matches and seven honored with positions at the US Youth Soccer National Championships in Germantown, Md. Washington's total number of referees invited to work the two regional tournaments were the highest among any state in Region IV, while its total of nine referees asked to officiate at Nationals this month also exceeded all their Region IV peers. 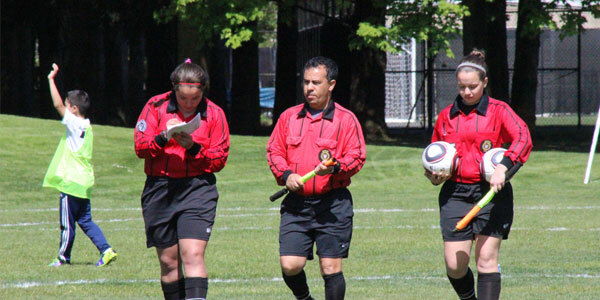 “These monumental successes are the direct result of Washington’s significant investment in their referee program,” said Richard Heorn, Region IV Referee Chair. Congratulations to the many outstanding referees who worked these games, and will be continuing on to Nationals! To learn how you can become a referee, click the Resources tab at the top of this page, then click “Referees”.